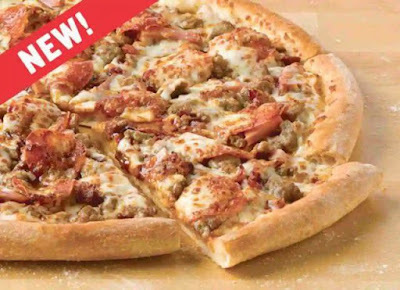 Papa John's adds a smoky twist to The Meats Pizza with the introduction of the new BBQ Meats Pizza. Like The Meats Pizza, the BBQ Meats Pizza comes topped with pepperoni, sausage, beef, bacon, and Canadian bacon. Where it differs is that it is spread with new Smoky Southern-style BBQ sauce rather than regular pizza sauce. For a limited time, they're running a deal where you can get a medium-size BBQ Meats or The Meats Pizza for $6.99 (may vary). In some areas, you can also get a large one for $9.99 (may vary).